Storage: Store in a cool dry place. Once opened, refrigerate and eat within 30 days. 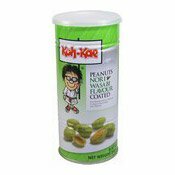 Ingredients: Peanut (50%), Wheat Flour, Glutinous Rice Flour, Corn Flour, Wasabi Flavour (6%) (Sugar, Wasabi Flavour, Salt, Flavour Enhancers (E621, E627, E631) , Tapioca Starch, Anti-caking Agent (E551), Palm Oil, Dextrose), Sugar, Salt, Nori (Seaweed) (1%), Raising Agent (E500), Sweetener (E950), Colour (E141). 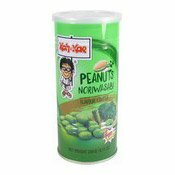 Simply enter your details below and we will send you an e-mail when “Peanuts Nori Wasabi Coated (大哥芥末花生)” is back in stock!